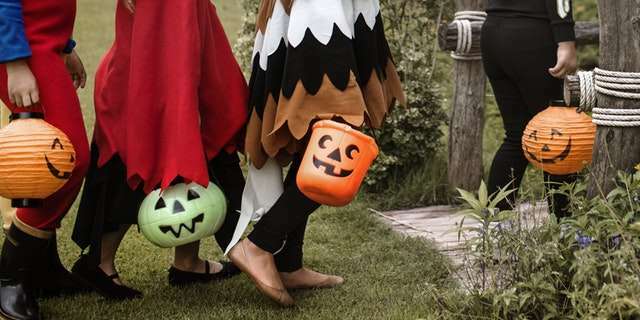 Whether you hosted the most ghoulish Halloween bash of the season that brought all the neighbors to your home, you received a few pranks left by tricksters, or you just spent a quiet and relaxing night in after taking the kids trick-or-treating; you probably have some post-Halloween messes to take care of around your home. No need to let out a scream of terror. Here are some ways to clean up common Halloween messes. From guts left behind in the carving process to aging pumpkins that met a rotten demise, it is fairly simple to clean away pumpkin goo. Start by taking care of large amounts of dried on or fresh gunk by scraping it away gently with a blunt object such as the dull side of a butter knife, a spoon, or even those scrapers that come in pumpkin carving kits if you have one. Take care of outdoor pumpkin splatter by simply using the hose or a pressure washer to spray it away. For indoor pumpkin messes after carving on fabric surfaces like carpet and rugs, mix up a quick spot treatment of a few drops hand dishwashing liquid and warm water. Use a white cloth or plain white paper towel to gently blot onto the pumpkin goo until it is gone. Rinse all the remaining soap away with fresh water. If your home or car has been egged by cruel pranksters you want to get to the egg splatter mess as soon as you see it. Dried egg, especially the yolks, can cause permanent damage to paint on cars and homes. If the side of your home had been egged grab your hose or a pressure washer and with the lightest pressure possible rinse off as much residue as you can. Next, grab a soft bristle brush and a bucket with dish soap and just warm (not hot) water. Dip the brush in the soapy liquid and gently scrub the egg away. For cars, give them a good bath without harshly scrubbing at the eggy spots. Rubbing alcohol is a great tool for cleaning remnants of spooky painted on faces left behind on carpet, upholstery, sinks, countertops, costumes, and even skin. Dab some rubbing alcohol onto a cotton ball and gently blot the stain repeating with clean spots of the cotton until the stain is lifted. (test the alcohol on unseen areas of fabric and textiles to ensure it is safe before going after a stain) Finish cleaning the area with a damp cloth to remove the alcohol residue. Cooking or baby oil can also be used on skin and hard surfaces to help clean away face paint. Melted candy in the carpet is a very common post-Halloween nightmare. Start by freezing the candy with an ice cube and gently scraping the large chunks away with a dull object. Once the large chunks are gone, grab a clean white cloth barely damp with water and dap the spot with water. If the stain is not lifting with just water, mix up some dish soap and warm water and gently blot onto the stain. Have a scary stain you can’t remove? All Kleen provides stain removal services in Mukilteo and surrounding areas. For stains that just won’t budge from your carpet, upholstery, hardwood, tile, or natural stone, don’t be afraid to call in a professional cleaning service. They can make Halloween clean up incredibly easy and have you ready for Thanksgiving just around the corner. For professional stain removal in Kirkland and surrounding areas make an appointment online or over the phone with All Kleen.